First motion is almost always a big event in the world of space exploration. Whether the first motion is of a wheel beginning to rotate or a rocket lifting off the pad, first motion means things are definitely changing. On day four of the upcoming shuttle servicing mission of the Hubble Space Telescope, there will be another such significant first motion. It will begin when a bolt that has been frozen in place for a decade and a half completes its 20th counterclockwise rotation. "When that happens, that will be the first time in 15-and-a-half years that our instrument will have moved over one one-millionth of an inch from its position aboard the Hubble Space Telescope," said John Trauger of NASA's Jet Propulsion Laboratory in Pasadena, Calif. "That is when the mission of the camera that saved Hubble will come to an end." 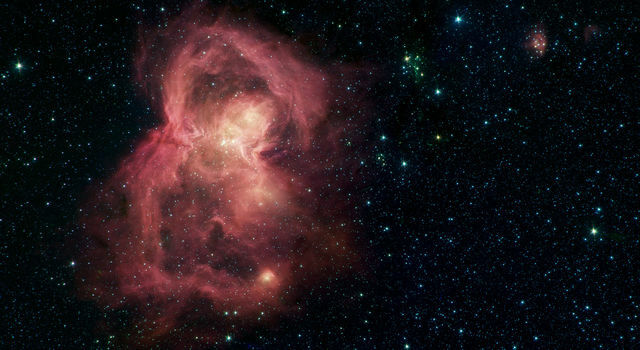 Certainly, the Wide Field and Planetary Camera 2 (WFPC2, as many scientists call it) is not your normal, everyday camera - it is the size of a baby grand piano. But then again, Hubble does just about everything big. Orbiting 353 miles up, the school bus-sized Hubble is one of NASA's premiere eyes on the universe. When light from a distant galaxy enters the telescope, it arrives untouched by the light-scattering vagaries of Earth's atmosphere. What happens next to this pristine, extra-terrestrial light is the reason the first motion of WFPC2 in 15-plus years is so significant. Because what happens next is -- as with all telescopes-- these photons of light bounce off the telescope's primary mirror. In Hubble's case, when light first bounced off its 8-foot (2.4-meter) diameter primary mirror, it bounced off in a way Hubble scientists and engineers did not expect - and did not plan for. Another problem -- by the time they realized Hubble's mirror might be flawed, it was already in orbit. ""Hubble launched aboard space shuttle Discovery in April 1990," said Trauger. "Discovery was already safely down on the ground before we recognized there was a problem, and that it would severely affect what science we could with the Hubble observatory." Ed Weiler is the associate administrator for NASA's Science Mission Directorate. Back then he was Hubble's program scientist. 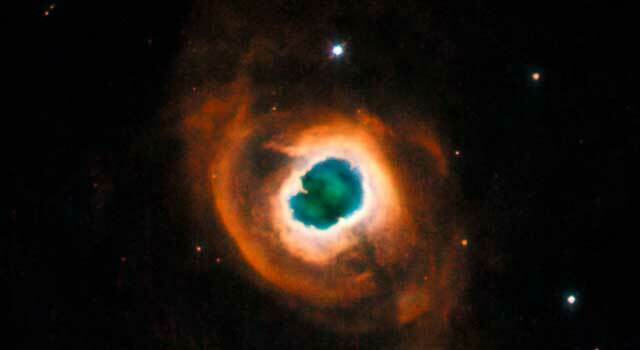 After the first images came down from Hubble on May 20, his outlook took a turn for the worse. "It was like climbing to the top of Mount Everest and then suddenly, within a couple of months, sinking to the bottom of the Dead Sea - the lowest point on Earth." 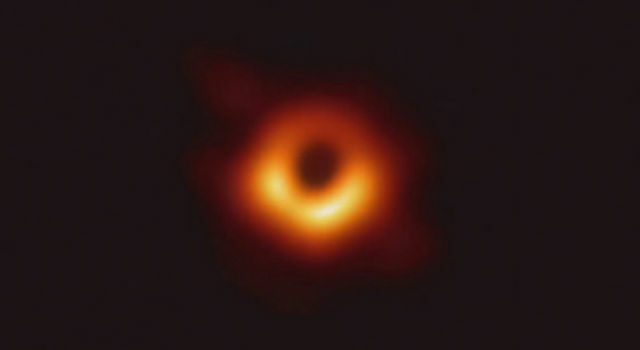 We figured out it was a problem we couldn't fix and we decided to do a press conference on June 27, 1990, and announce to the world that the pictures we promised, the science we promised, wouldn't be delivered by the Hubble Space Telescope." The theories on what caused the problem were plentiful and some more than a little wild. While theories were bandied about, there was a toll taken on the team. "It was a very sad, very difficult time," said Dave Leckrone, senior project scientist at NASA's Goddard Space Flight Center in Greenbelt, Md. "Astronomers had planned very detailed scientific programs that would take full advantage of this wonderful image quality that Hubble was to provide. They became very, very discouraged when they saw the images coming back from the telescope. Some of them left the program in disgust." The theories on what exactly happened to Hubble flew fast and furious. The main problem with proving any of them was that much of the evidence was located 350 miles straight up. NASA appointed JPL's director, Lew Allen, to chair a board to investigate what had happened to Hubble. But investigative boards are thorough and take time to get it right. Answers and action were needed now, and it was someone else from JPL who provided Weiler and the Hubble team some hope. "Around the time of that (June 27) briefing, John Trauger cornered me in a hallway outside the space telescope science working group meeting and said, 'Ed, I think we have a way to fix with the Wide Field and Planetary Camera 2,'" said Weiler. "You cannot believe how down every astronomer on the Hubble team was that day because we didn't have the telescope we thought. So, John gave me this one ray of hope. It was one little ray of hope and I glommed onto it." The beginning of the heroic fix of the Hubble Space Telescope began even before a problem was known to exist. Even before the telescope hit the cold, dark, unforgiving blackness of space. It was back in 1985 that Weiler moved heaven and Earth to make sure Hubble's universe had a spare Wide Field and Planetary Camera on hand. "A number of people in the science working group, but in particular Ed Weiler, the program scientist, drew the conclusion that the Hubble is all about imagery," said Dave Leckrone. "It is all about taking clear, sharp, beautiful pictures of the sky and doing fantastic science with those images (see companion article: "A Universal Art Form"), and it is unthinkable that Hubble should ever go blind. That was the mantra. We could never allow Hubble to go blind, so let's build a replica of WFPC." By the time Discovery deposited Hubble in orbit, the Wide Field and Planetary Camera 2 was well underway. A few days after the first image from Hubble hit the cover of the New York Times, JPL scientists Aden and Marjorie Mienel dropped by the camera team's offices at JPL. The Mienels had a lifetime of experience with astronomical telescopes and they smelled a rat. It was perhaps the first time one of the most dreaded terms in all of astronomy was uttered in reference to Hubble: "spherical aberration." 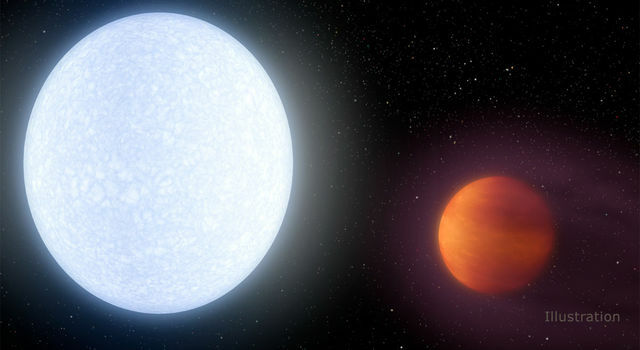 "Spherical aberration happens when the primary mirror is polished incorrectly," said Trauger. You can think of the mirror as a very shallow bowl. With spherical aberration it's just a little too shallow, a little too flat." Later, the investigative board chaired by JPL's Lew Allen would trace the source of Hubble's spherical aberration to faulty test equipment used to define and measure the primary mirror's curvature. But now, JPL's Hubble camera team was concerned with what could be done about it. Aden Mienel had suggested that the space telescope's optical issues could be worked out by reworking the optics of their new, still to be completed camera - WFPC2. "Norm Page, a JPL optical engineer, was the custodian of our optical prescription for Hubble," said Trauger. "I went down to the lab with and we played with our model of our new Wide Field Camera. We soon realized that Aden was right, that we could correct for Hubble's mirror by replacing four small mirrors, each the size of a nickel, inside our new camera. It was only when armed with that information that Trauger approached Weiler with the proposed fix prior to the first media briefing about Hubble's imaging problem. And Weiler told the world about it during the briefing. That there was a date in mind for a repair mission and that the spare Wide Field Camera would play a big role. But few in the media noticed. "I announced... in three years, by December of 1993, we would launch the clone, the wide field clone, and we would fix the problem," said Weiler. "Nobody believed us, that we would do it, and that we could do it. So it was a disaster in the press for many months thereafter and suddenly in the press was born the term "Hubble trouble." 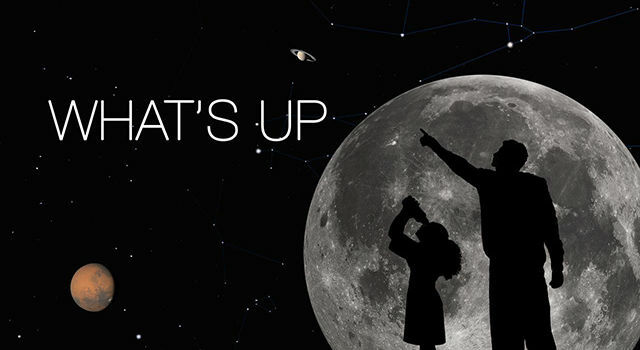 One thing we learned from that is never name a telescope after someone who rhymes with trouble." The bad press kept coming and Hubble's troubles became the fodder for more than one late-night comedian. Hubble and failure had become part of the American Zeitgeist. "I remember giving a talk to some kindergarten kids about the wonders of Hubble," said Trauger. I said the words Hubble Telescope and everybody laughed. They didn't know what it meant but they knew it was funny. Back then, everything about Hubble was funny all of a sudden. Trauger, the Wide Field and Planetary Camera 2 project managers, Dave Rogers and Larry Simmons, and a team that at times exceeded more than 100 engineers and scientists, learned what it was like to live life in a fishbowl. Everything mattered, and everything aboard their 610-pound camera had to be right, checked and double checked and then checked again. If they needed any further reminding, they got it the day NASA Administrator Dan Goldin paid them a visit. "Goldin came to the cleanroom where we were doing some testing and asked what was going on," said Trauger. "Larry Simmons said - 'well, we are here to fix the Hubble Telescope.' Goldin's response was - 'no, you are here to save the agency.'" Everyone working on the camera knew the score. Not only its importance to NASA's future, but the open questions that would not be answered until their camera was on orbit and firing back images, because they had never done anything like this before. We purposefully made the mirrors in our camera out of focus, said Trauger. "The inverse of, and just as profoundly out of focus as, the Hubble telescope was. And that was not easy to measure in a laboratory because you can't just look for a sharp focus, you have to look for something you think exists aboard Hubble." Trauger and his team delivered the Wide Field and Planetary Camera 2 to the Goddard Space Flight Center ahead of schedule. They ushered it through final testing and watched as on December 2, 1993, space shuttle Atlantis carried the hopes and dreams of so many into space. "Off it goes and you can only imagine what it would be like to be an astronaut in the midst of that violence," said Trauger. "But what I couldn't help thinking was we spent the last couple of years aligning the optics of this delicate camera and everything has to be so perfectly aligned to work, and here it is just getting shaken all over the place." Sixteen days later, Trauger, Weiler, Leckrone and several other members of the Hubble Science team were crowded around a monitor in the basement of the Space telescope Science Institute in Baltimore to see if the camera's optics would prove them right -- or wrong. "We were all holding our breath, crossing our fingers and doing a lot of praying and hoping that things were going to look at lot better this time," said Leckrone. The images that came down were so sharp we knew we had succeeded. There was just intense joy, people slapping others backs. I'm sure there were tears in more than a few eyes." "It was a huge relief," said Trauger. We knew this was the beginning and not an end, that Hubble's science program could now kick into high gear." On Thursday Jan 13, 1994, NASA released its first images from the new Hubble. 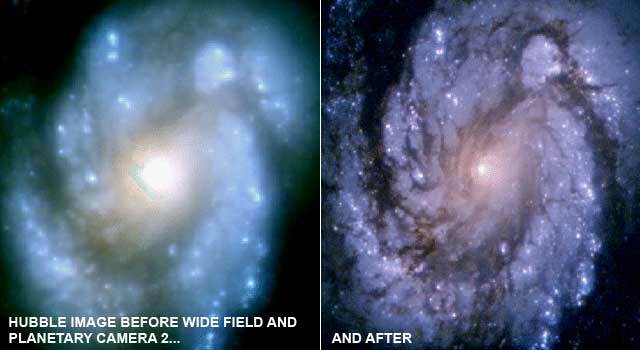 Among them a "before and after" picture taken of spiral galaxy M100. The difference in picture quality was startling. The picture would appear the next day in papers around the world. It was taken by the Wide field and Planetary Camera 2. It indicated to the American people and the world that "the trouble with Hubble" was now over. Over the next decade-and-a-half, JPL's Wide Field and Planetary Camera 2 would take over 135,000 observations of the universe. It images would go on to adorn posters, album covers, screen savers and science text books throughout the world. And in 2007, Hubble's workhorse camera would once again "save Hubble" when the Advanced Camera for Surveys, a more technologically advanced camera than WFPC2, failed. Having been placed aboard Hubble in 2002, the advanced camera had been in orbit five years. "When the Advanced Camera for Surveys failed, there was good old WFPC2 still chugging along," said Dave Leckrone. "Just amazing to have gone all of these years, that camera is still working very well. And I think that is a huge credit to the engineers at JPL who designed and built it. Just an amazing instrument." Trauger, the principal investigator for the Wide Field and Planetary Camera 2 during its entire lifetime, has fond memories of the camera and the team that made it work - so very well. But he also knows its time in the spotlight is drawing to a close, and like a good scientist, he looks forward to the discoveries to come. "As the only instrument to remain in service since the repair mission in 1993, it certainly has served its mission," said Trauger. "But WFPC2 is the grandpa of Hubble now. It is old and tired and it's time for it to be brought home. "And what is going to replace it is going to be even better. It has newer technology and it's going to renew the whole mission." Hubble's new Wide Field Camera 3 not only looks like JPL's original WFPC and the veteran WFPC2, it carries its heritage into space with it. 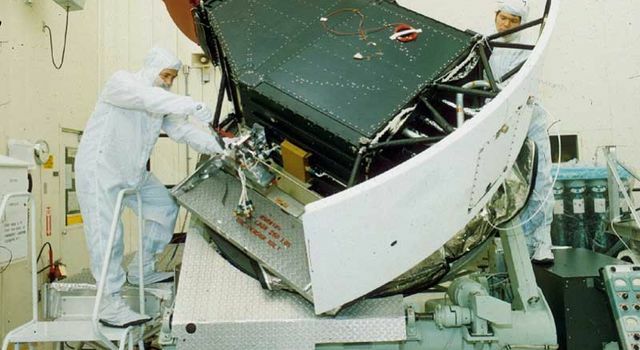 The Wide Field Camera 3's housing, radiator and other components came from the original WFPC which returned to Earth at the conclusion of the first Hubble servicing mission. On the morning of the fourth day of the final Hubble servicing mission, rest assured the men and women who lived through "the trouble with Hubble" will be watching as astronaut Andy Feustel turns that bolt for the 20th time, and the Wide Field and Planetary Camera 2 begins to stir. "You know, JPL promised a lifetime of only three years when we launched it in 1993. It is still working today, over 15 years later," said Weiler. "It is going to be a tough moment when it comes out of the Hubble because I remember exactly the moment it was placed in the Hubble. I can still see the astronauts slowly pushing it in and hoping upon hope that we got the prescription for the thing correct. I will always remember that moment when it was coming in. I am sure I will remember the moment when it is coming down. "But I really look forward to the moment when I get to walk up to it and touch it someday in the Smithsonian and say, 'that is the camera that saved Hubble.'" The Wide Field and Planetary Camera 2 was proudly designed and built by NASA's Jet Propulsion Laboratory, Pasadena, Calif.